Continuing the topics related to helping coaches run a safe, sound and efficient strength program we address the issue of how often an athlete should lift weights. Our experience in strength training indicates 1-3 times per week is best. This actually depends on whether or not the athlete is in season, offseason, how advanced they are, and the experience they have. Ted Lambrinides, "the head of the exercise science department at Thomas Moore College and a long-time consultant with the Cincinnati Bengals" believes, "There are a number of factors (nutrition, lifestyle, emotional stress, sports/practice, injury, number of exercises performed in a workout, level of trainee, volume of work performed per workout) which can influence training frequency recommendations." Many athletes seem to respond best training 2 days per week. Three days per week usually is best for beginners because they are just learning the movements. An athlete’s progress seems to be slowed when training more than three days per week. Many coaches are caught up in training athletes 4-5 days per week. However, even though you may be training different muscle groups Monday and Tuesday, an athlete needs that full day of recuperation in-between. If training on a proper controlled movement program, all muscles of the body are affected on many lifts (which is a major positive to those of you who follow Olympic lifting programs). For example, one program I witnessed had the athletes squat one day and do deadlift the very next day. You are training similar muscle groups in those two exercises. As stated earlier, 2 days a week seems to be ideal for most athletes especially it they are going to do full body sessions. 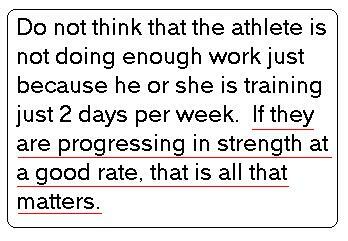 Do not think that the athlete is not doing enough work just because he or she is training just 2 days per week. If they are progressing in strength at a good rate, that is all that matters. This is the point at which many weight room coaches, especially at the high school level, where these coaches are also the football, wrestling, and basketball coaches, are not comfortable. Their priorities are with the nuances of their sport not necessarily the nuances of the weight room and how their athletes can improve the best. Three days per week is also an excellent frequency for many athletes. The rotation should be Monday: upper body, Wednesday: lower body, Friday: upper body. That way the athlete gets plenty of recovery time between training sessions. StrongerAthletes.com suggests athletes train with a high intensity. That’s why 2-3 days is best. Athletes that do Olympic lifts can train more frequently because these lifts are less intense because of the fact that momentum is involved which takes the stress off the working muscles which indicates that the weight being used is lighter. Lambrinides explains, "Olympic lifters may train more frequently because much of their work is skill work using light training loads. They may train more frequently to fine-tune their execution. Training 2 or 3 days/week are as effective training frequencies as any as long as intensity is high. There does not exist any scientific literature to my knowledge that would suggest that he more advance trainee needs to train more frequently, although some do." StrongerAthletes.com maintains that the more advanced an athlete is in strength training the less they need to train. The following schools were brought to our attention this week as those who follow safe, productive, and efficient methods of strength training like those we promore at StrongerAthletes.com. They have been added to our Teams Page.